Course Website: Official Website - Visit Clear Creek Golf Club's official website by clicking on the link provided. 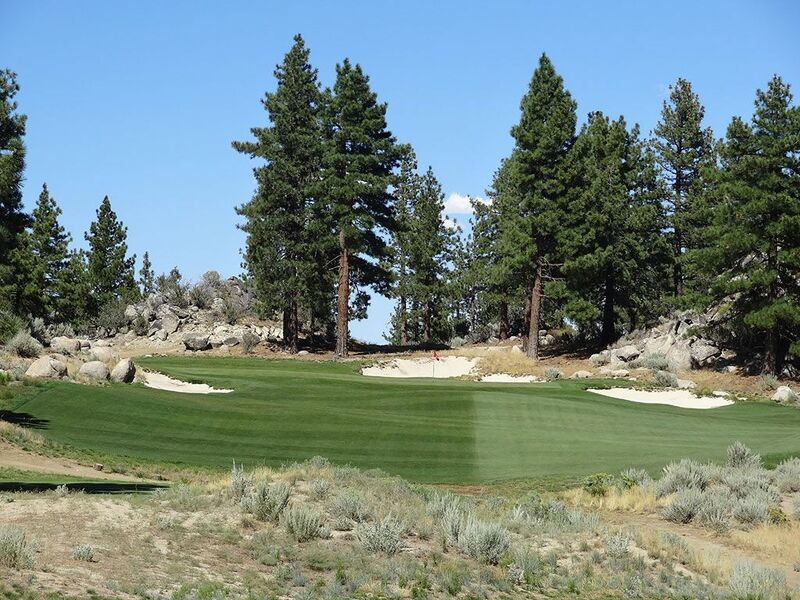 Accolades: Ranked 5th in Nevada on Golf Course Gurus' Best in State list. 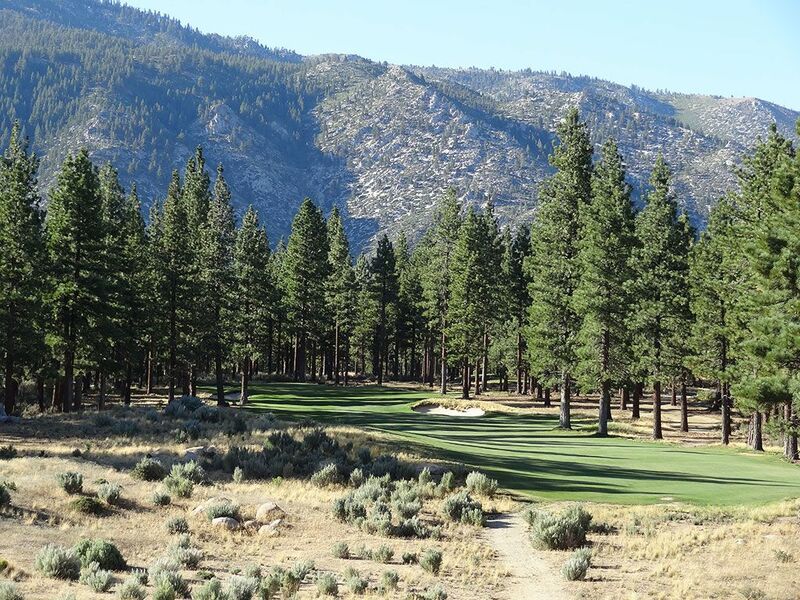 What to Expect: Coore and Crenshaw's design outside of Carson City in Northern Nevada is a commendable mountain course that features significant elevation changes, heavy tree lines, and the biggest pine cones I've ever seen in my life. The par 71 layout features three par 3s on the front and a pair of par 5s before routing the traditional par 36 setup on the back (As an interesting side note, the scorecard on the club's website shows #1 as a 454 yard par 4 but my scorecard shows it as a 515 yard par 5. I'm assuming it was originally a par four and a couple of tees were added which would make sense since the back tee was pretty remote with a dirt path leading to it). The course hits an early climax at the par four 3rd hole where players are afforded a stunning view and exhilarating tee shot from a severely elevated tee. Golfers who have played at Old Sandwich south of Boston will find several style similarities as well as the same firm and fast conditions leading into true greens. In classic Coore and Crenshaw fashion, minimal movement of dirt was a priority in the design with the 17th hole being the most pure example as the green is exactly as Mother Nature shaped it. 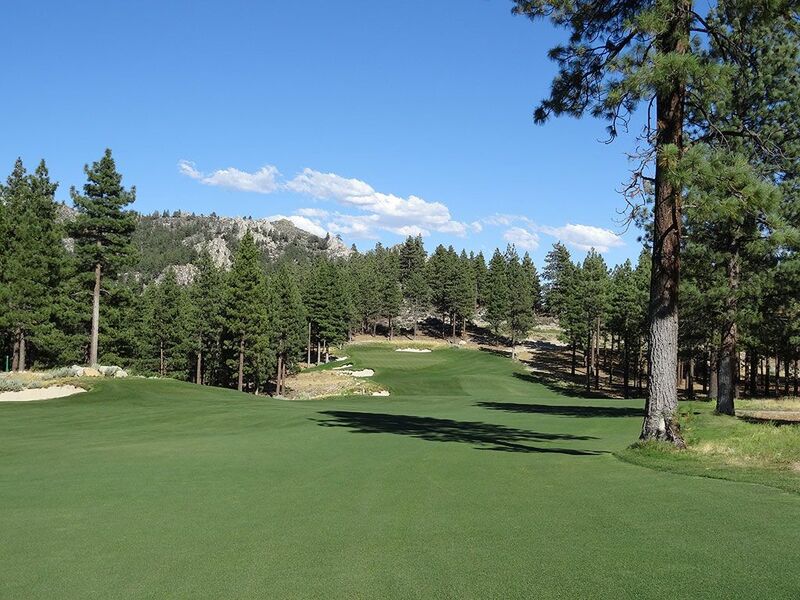 Unlike most Coore and Crenshaw courses, you won't find many players walking the course due to some of the distances between holes paired with the strong elevation changes that are common among mountain courses in the West. 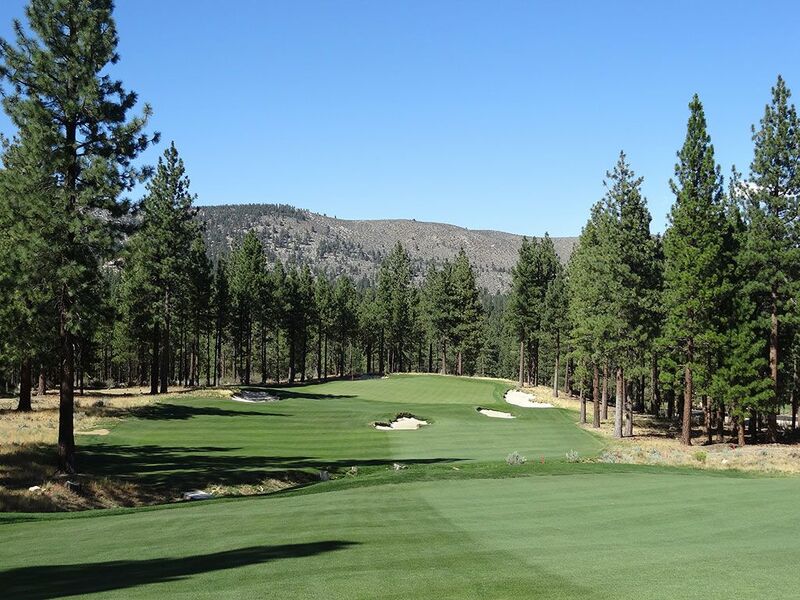 While it may not be the best course in Tahoe, The Club at Clear Creek is certainly in the conversation of the elite courses in the area. Signature Hole: 3rd Hole – 508 Yard Par 4 – Coore and Crenshaw take advantage of the strong elevation changes found on the property by designing the most dramatic hole on the course with this lengthy par four. The tee shot goes from the highest point on the course and drops to nearly the lowest; a change of approximately 200 feet tee to green. The towering tee ball plays to a generous fairway that gives enough width to provide sufficient forgiveness that is necessary on a tee shot that will enjoy such lengthy hang time. The approach shot plays over a hazard to a green that tilts from left to right and features a fairly generous opening to chase a ball onto the putting surface away from the surrounding bunkers. 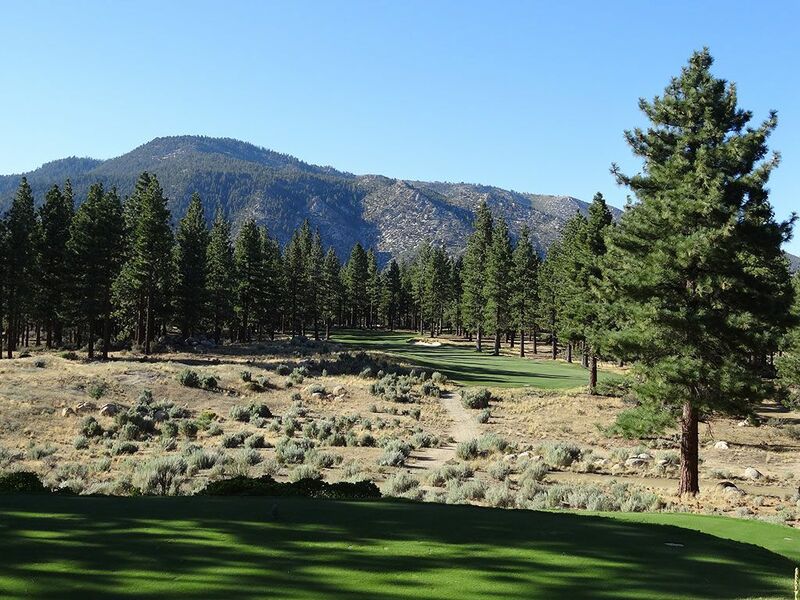 With the impressive mountain back drop, exhilarating tee shot, and enjoyable approach shot the 3rd hole combines to be the most memorable hole on the course. Best Par 3: 2nd Hole – 178 Yards – Clear Creek's best feature isn't its par threes, however the 2nd hole comes through with a strong offering. 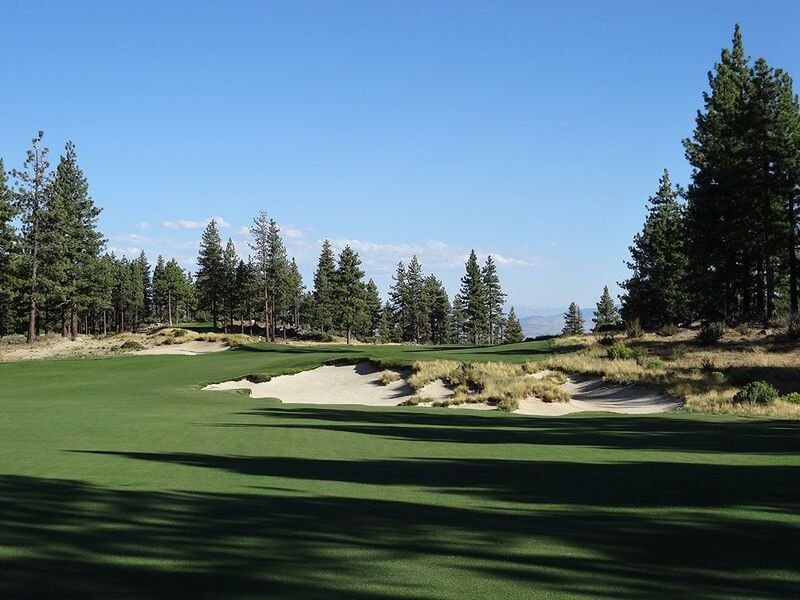 This attractive uphill one-shotter plays to a green that features a bunker short left and another short right while the front is wide open with the exception of a small grass knob. 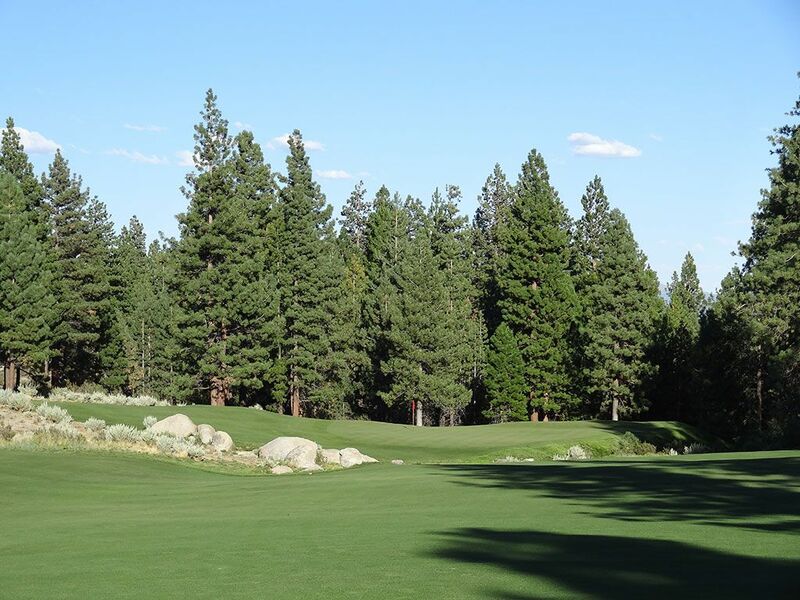 The setting features a collection of pine trees and boulders that surround the hole in an attractive fashion and emphasize the natural terrain. A swell runs through the middle of the green which adds an additional hidden feature and extra anticipation when coming up to discover where you ball rests on the putting surface in relation to the hole. This semi blind shot uphill is quite the contrast to the towering downhill tee shot that follows, an enjoyable contrast and combination for sure. 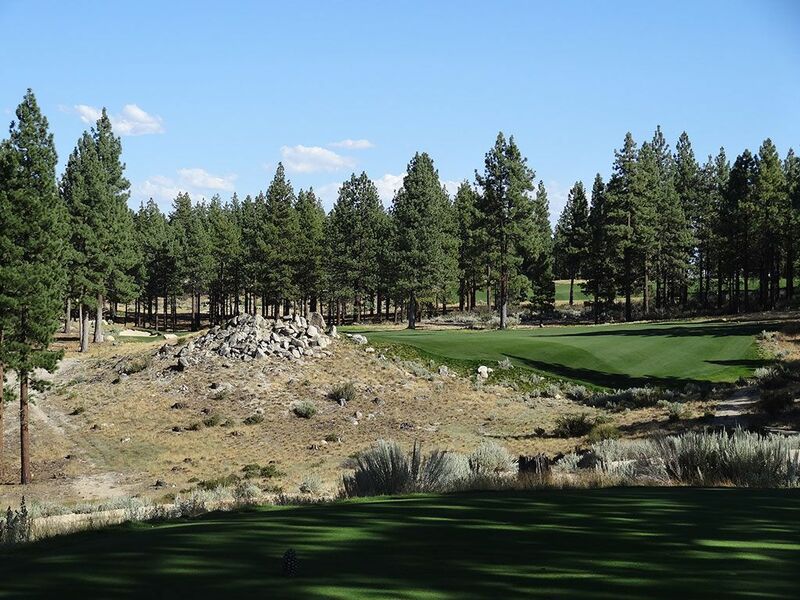 Best Par 4: 9th Hole – 443 Yards – This dogleg left is unassuming off the tee as players take aim over the pile of boulders in front of them with little idea what lies ahead. 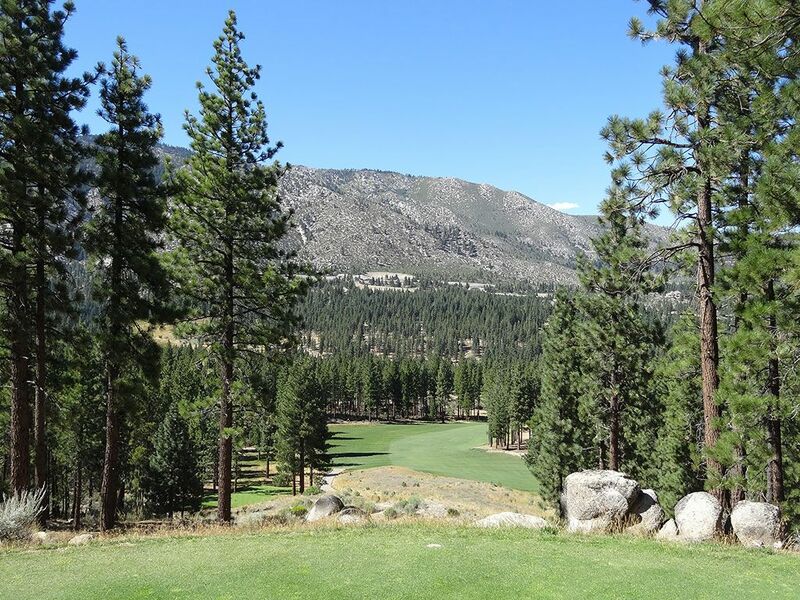 Upon coming around the corner, players are afforded a stunning view of a downhill approach shot framed by rocky mountains on the left and towering pine trees circling behind the putting surface. The rolling putting surface and artistic bunkers combine to put the finishing touches on one of the most exciting and attractive holes on the course. Best Par 5: 13th Hole – 635 Yards – I quite enjoy holes that look average off the tee and then unveil a climatic ending greensite such as the 4th hole at Bandon Dunes and the 8th at Pebble Beach. 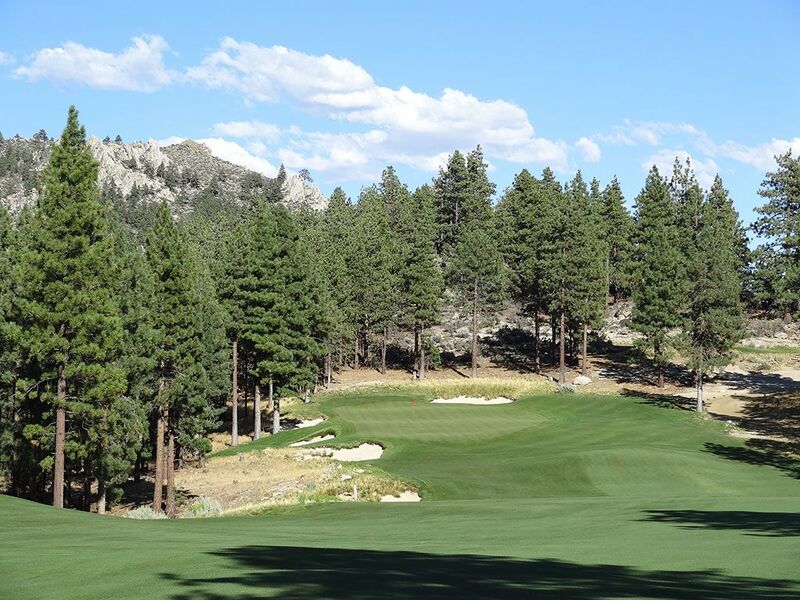 The 13th at Clear Creek falls in this category as players work their way around the bunker on the right before being presented with a gorgeous view of a greensite that features a natural waste bunker 100+ yards short and left of the putting surface and then mountain and valley views beyond the infinity edge. 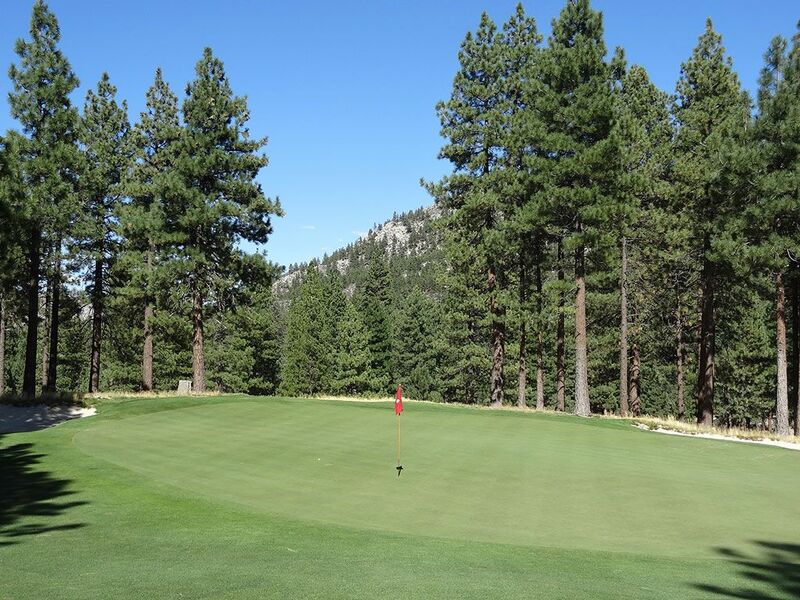 Birdie Time: 14th Hole – 320 Yard Par 4 – Time to grip it and rip it! Though this hole can be intimidating with its narrow fairway that gets pinched by a bunker on the right and trees tightening both sides, the short overall length lends itself to taking a rip at the green with your driver and hope for the best. A nice draw will benefit from the greatest amount of roll and chance to chase up onto the putting surface will tee shots that finish in the shallow half moon bunker surrounding the green will result in an extremely difficult up and down situation. A conservative tee shot to the wide part of the fairway will still set players up to take dead aim on a wedge shot that they can nestle in near the flag and knock down a birdie putt. 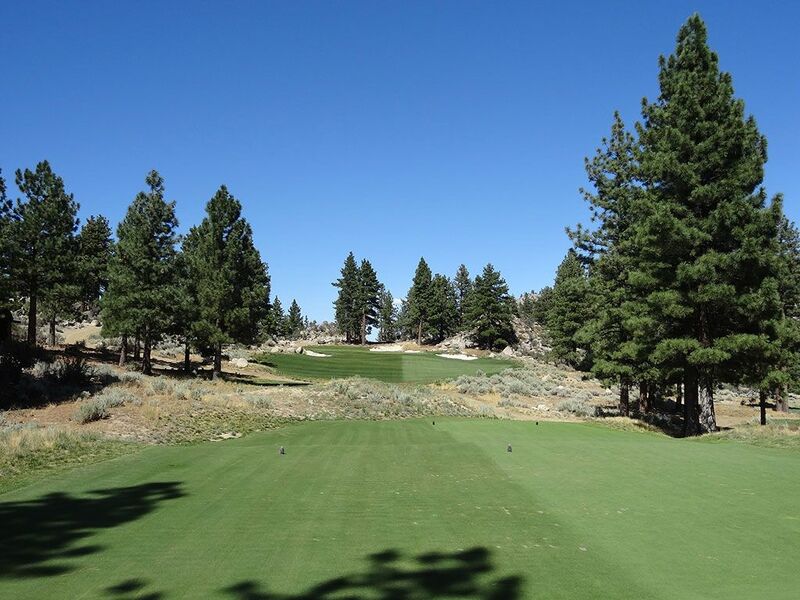 Bogey Beware: 15th Hole – 448 Yard Par 4 – With a hazard in front of the tee and a hill of sage brush, the view of the fairway is limited as it doglegs left out of sight. A dry ditch hazard runs of the left side of the hole before cutting back in front of the green thus becoming a looming presence throughout the hole. With the hole turning left and the hazard running that same side, it becomes quick risky to challenge the corner in an effort to cut yardage off the hole. The left side continues to offer peril on the approach shot as the slope on that side of the green can kick the ball towards the fall off found on the right side of the putting surface. Nothing less than pure precision will be required to dissect this hole.